Drones are becoming more and more commonplace. For the shopper looking to acquire one, the prices are pretty much within reach of the regular person; a drone can be purchased for as little as $50.00. One man appears to have decided to use a drone to take pictures of the Phillies game on Sunday afternoon. That idea went horribly wrong. Around the 6th inning, security officials noticed and notified police, who quickly apprehended the man. Police then turned the investigation over to the FAA. 6ABC reported that it was Eagles security who actually apprehended the man, who was operating the drone from outside the stadium. The man cooperated with security and police, according to the report. The man also had a gun on him, but it was legally registered. 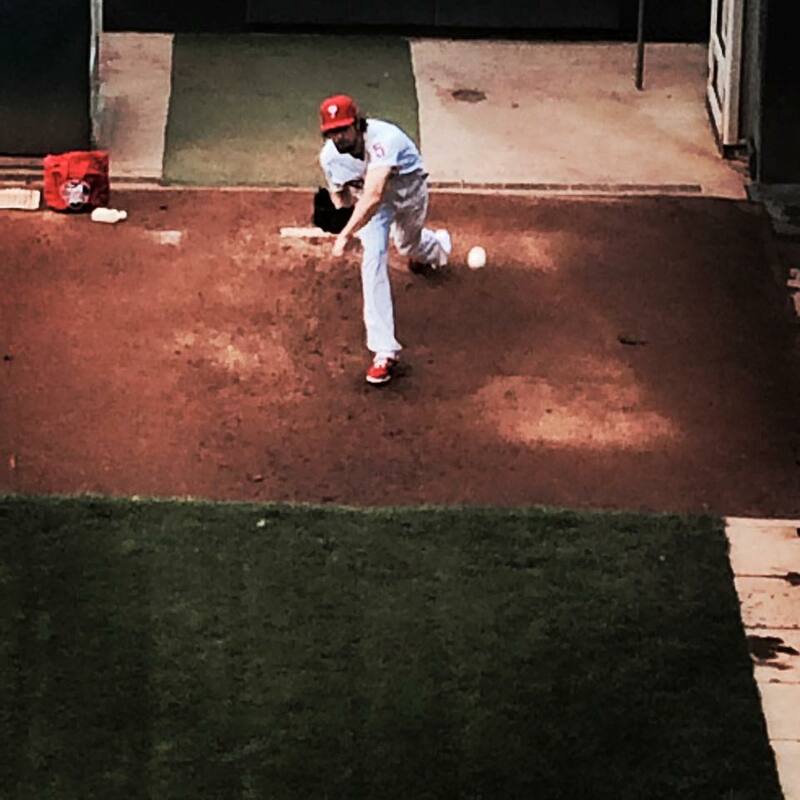 The Phillies are getting good solid starting pitching from their ace Cole Hamels and from the veteran Aaron Harang. Still giving starts to Severino Gonzalez and Sean O'Sullivan, the Phillies are incredibly thin in the starting pitcher department. With potential trades on the horizon for both Harang and Hamels, the Phillies need some veteran arms to pitch the innings without putting undue pressure on the bullpen. One option just became available. Veteran starter Kevin Correia informed the San Francisco Giants that he was going to opt out of his minor league contract. Correia has made six starts in the Giants system this season, going 0-1 with a 3.58 earned run average. The Giants starting rotation is full, so Correia was not going to get a chance there. The Phillies could use Correia immediately to give Severino Gonzalez time to develop at AAA. The Phillies have not let Gonzalez pitch deep into any ballgame. Correia will not be much more than Jerome Williams has been to the Phillies. But that is okay; the Phillies need to let young players develop in the minor leagues and put the young players at the major league level develop. An overexposed bullpen has not helped the likes of Justin De Fratus and Jake Diekman, who have pitched too much in 2015. Correia is 34 years old and has a lifetime record of 76-95 in his major league career, which began in 2003. Correia has pitched with the Giants, the San Diego Padres, Pittsburgh Pirates, Minnesota Twins, and Los Angeles Dodgers. Who knows - Correia was traded at the trade deadline in 2014 - maybe the Phillies could even get something in return for him later. The Philadelphia Phillies will try to end their second six game losing streak of the season and avoid a series sweep to Colorado Rockies this afternoon. They are trying to avoid their second consecutive series sweep. Aaron Harang gave the Phillies six strong innings yesterday but it was not enough. Jerome Williams will take the mound today. Game time is 1:35. "Now, either you are deliberately playing out of tune and sabotaging my band, or you don't know you're out of tune, which I'm afraid is even worse"
To lash out at the fans in defense of the moves he's made proves he's either ignorant of his own incompetence... Or he's deliberately sabotaging the team . I know, I know-- this isn't a movie, and Amaro is doing his best. As such, real life offers few guarantees for happy endings, and Amaro should probably answer for the mistakes that he's made come season's end. One of those mistakes may have been the hiring of Ryne Sandberg. Aaron Harang pitched decently enough to win, but thanks to another poor offensive showing from the Phillies lineup, Harang's effort was wasted. Harang went six innings and allowed just two earned runs. Both runs were solo home runs: one from third baseman Nolan Arenado and one from Mike McKenry. For a good while yesterday, it looked like the Phillies were going to be no-hit by Rockies starter Chad Bettis. The rookie Bettis got all the way into the eighth inning before a questionable defensive alignment - a shift against left fielder Cody Asche - led to a single right to the shortstop's usual position. The Phillies bats hope to show up a little bit today as they take on Jorge De La Rosa. Just a few days after ESPN's Keith Law ranked Phillies top prospect J.P. Crawford as the #4 overall in baseball, the 20-year-old shortstop has been promoted to Double-A Reading to join the likes of Roman Quinn, Aaron Nola, Zach Eflin, Tom Windle, Ben Lively and others. Philadelphia, PA - Five years after Roy Halladay fired a perfect game for the Phillies, the home team was looking at a similar fate for much of the night. Chad Bettis had it all working tonight against the Phillies. The line up itself is about as good of a line up as the team has rolled out this season and while that isn't saying much, nobody was expecting Bettis to flirt with perfection. Through six innings they were kept off the bases. An error by Troy Tulowtizki in the 7th, cost the perfecto but left the no-hitter intact. Cody Asche finally broke it up in the 8th and Carlos Ruiz would single as well. Darin Ruf would be called out on a check swing which would eventually lead to dramatics in the bottom of the inning that would send Ryne Sandberg to the showers ahead of everyone. The Phillies would plate one on an error in the 9th but it wasn't their night at the plate. Cole Hamels really could not have pitched much better than he did tonight. He did allow two solo blasts from Tulowitzki but was in as good of a mode as he's been in lately. He would pitch eight strong innings, just allowing the two runs and striking out nine. Ben Paulsen who was a defensive replacement would open up the lead in the 8th with a two run blast off Luis Garcia to make it 4-0 which was plenty for the Rockies heading into the 9th. Greg Vince (@GregVince) is a staff writer for Philliedelphia.com.